HURLEYVILLE, NY (January 22. 2014) – The Hurleyville Fire Department in cooperation with the Town of Fallsburg Youth Commission will be holding their 26th Annual Ice Fishing Contest on Saturday, February 8. 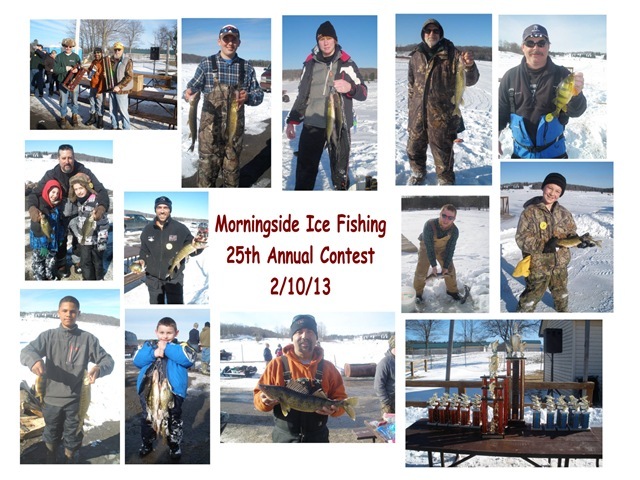 The contest will take place on Morningside Lake off of Brickman Road in Hurleyville from 7:00 a.m. – 3:00 p.m. Registration will take place the day of the contest at the lake, registration is $5.00 for adults and free for those 15 and under. The annual Super Raffle will also be held that day, with a chance to win a gas generator, a 32” flat screen TV, mountain bike and other great prizes. Refreshments and bait will be available, and holes will be drilled for all who need them. There will be an adult and youth division with trophies for first, second and third in the following categories: perch, pan fish, bullhead, walleye and pickerel. All fish must be legally caught and of legal size. There is also a special Firemen’s Contest. The Rich Farquar Memorial Chief’s Cup goes to the top firemen’s fishing team. A team can be one, 10 or as many that show up. All team members must belong to the same fire department. As in the past the cup is passed from year to year to the winning team. There is also a first, second and third place team trophy in the fireman’s contest. Last year’s winner, the Smallwood/Mongaup Valley Fire Department will be out in full force to defend the cup that they won, and it’s likely that past champions Neversink Fire Department and the Loch Sheldrake Fire Department will be there in force to try and win it away. This contest has produced some real big fish in past years. Once again this fall, over 1200 walleye were stocked in the Morningside Lake. Over 10,000 walleye were put into the lake in the last 10 years by the Town of Fallsburg, and the Hurleyville and Loch Sheldrake Fire Departments. For more information please contact J.W. Halchak at 845-436-5418 or by email at jampond@hvc.rr.com, or call George Price at 434-3475 or Fred Turner at 434-7706. Visit www.hurleyvilleny.com to see pictures of previous contests.